I’m in the middle of a spinning project for a friend, and this fiber is totally addictive! It’s a good thing the BFL is so easy and such a joy to work with, because otherwise I might be tempted to just sit and stare, admiring the pretty colors. It’s one of those projects that’s taking ME along for the ride, instead of me directing the progress… it’s addictive! At the rate it’s going, I expect to have finished yarn pictures to share with you soon from this spinning project. The singles are looking beautiful, but my favorite part is always the plying. It’s totally “the moment of truth” when you get to see how the colors are really going to come together in the texture format of a finished plied yarn. I’m looking forward to it! I just love knitters. Isn’t it amazing how the connections we make between other fiber enthusiasts on the internet can turn into something really special? Recently I’ve been donating some of my time to the Design Donors, a Ravelry group for helping new groups get set up with their theme decor, for people who may not possess the skills or software to do it themselves. I started doing this because I wanted the practice to brush off my graphic design skills, and I didn’t mind donating the small amounts of time such projects normally take. I had no idea these little favors would turn into such beautiful yarn! I did a little group badge and banner project for a Finland-based group without thinking much of it; I mean, I couldn’t even understand the text I was applying to the images! I just whipped up the banners and delivered. But Niina, the group admin, is such a sweetheart that she sent me this gorgeous package of yarn and goodies from Finland as a thank-you. The above is an aloe-infused wool/nylon sock yarn in an orange I love (and it actually looks like a colorway I designed, that’s how “me” it is), and below is some RED laceweight that really tugs my heartstrings. I have always loved a good red, and I always swear I’m going to knit lace “just as soon as time allows.” You know how that one goes! Still, I’m not sure what I like best, one of the yarns, or the adorable handmade teddy bear buttons they came with. I just love collecting buttons… Niina really had my number when she was putting together this package! I was really taken by the generosity of this Ravelry friend, and am so excited to try out some yarns from so far away! Who cares if I can’t translate the labels or pronounce the names… lots of great yarns have names that are hard to pronounce! The last in my series of “professional photos of my professional knits.” This hat and sweater set I did for Knit Picks, to show off a classic KP pattern in a new yarn, the dyed and heathered colors of the Simply Cotton Sport. My favorite aspect of this project was probably the cute little “ears” detail on the hat. 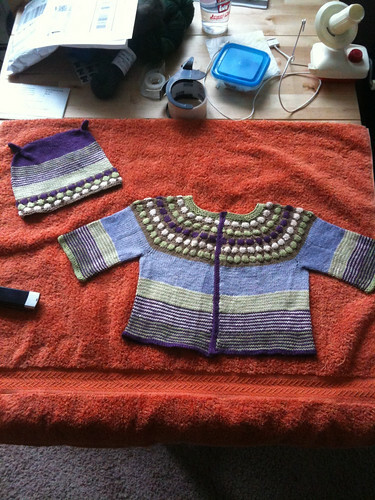 My least favorite aspect was definitely the amount of ends-weaving. Oh, the drawback of knitting colorwork! I don’t usually get into purple, but sometimes the fun of these commission projects is working outside of my comfort zone. I get to try yarns/combinations/techniques that I wouldn’t ordinarily pick for myself. All three of the KP projects I’ve shown you recently have been in cotton or cotton-blends, which I rarely if ever knit of my own devises. But, I have enjoyed working with the yarns, and I particularly appreciate the smoothness of the knitted fabric. It’s really ideal for baby wear like this set– no fuss, no muss! Again though, I’d leave out the ends-weaving if I could. As usual, I’m including that second picture both as a point of comparison between professional and phone photography, and to prove that I’m not just ganking KP images here! I really have been working on secret projects behind the scenes, and the blogging delay means that I get to share the extra nice pictures eventually. Not sure when the next secret project will become available for sharing, so in the meantime you’ll have to look forward to my regular old blog posts to keep you busy. I think knitters universally agree that baby stuff is great to knit. It’s satisfyingly quick to knit and it’s just SO darn cute! An item’s adorableness exponentially increases as its size scale diminishes. Knitted grown up slippers? Pretty neat, OK. Knitted baby booties? OMG squee! This booties and hat set is a sample knitting project I did for Knit Picks back around New Year’s. I finally found it published on their site, meaning I’m free to share the pictures with you! The pattern is from Natural Nursery Knits by Erika Knight, and it has everything you want in babywear- no fuss cotton yarn, adorable styling. 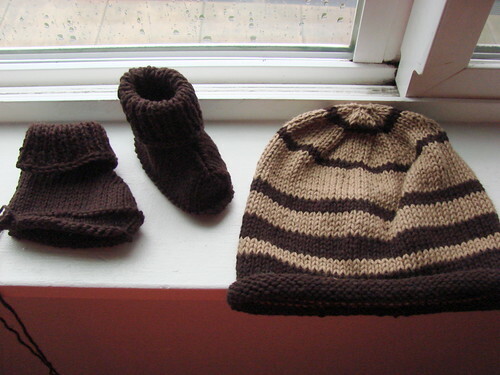 The only problem is, both the hat and the booties are knitted flat and then seamed. 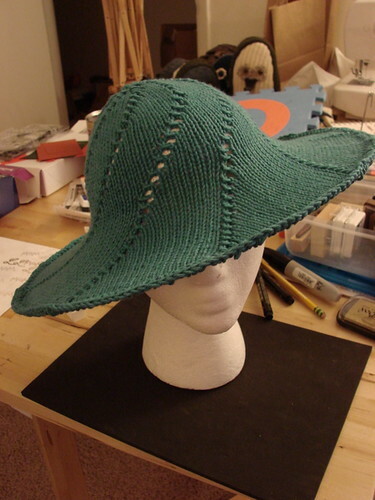 I don’t mind seaming (I kind of like it actually), but do you know how many extra ends to weave in that created on the striped hat, since I could carry yarn up the inside when the stripes were an odd number of rows? I think pattern publishers (especially British ones, like Debbie Bliss?) always default to “knit flat and seamed” since it requires the least common denominator of tools- straight needles. Personally, I say invest in a set of DPN’s in the sizes you use a lot, and let the knitting options flood in! I guess there is the other end of that extreme, too. The sample-knitting project I’m currently working on has required no less than 7 sets of circular and double-pointed needles, all in various lengths and sizes. It’s a doozy! Of course I won’t be able to blog about it for several months again, but I’m willing to bet you’ll be impressed when it finally comes out. I know I will be (whenever I finally finish it)! 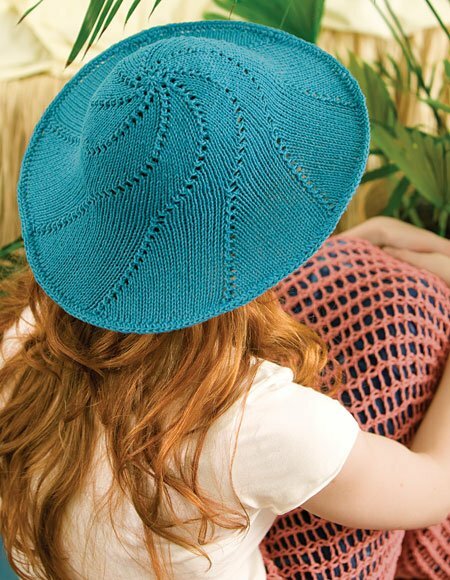 The name of this pattern, from the book Knitting in the Sun, is “Windansea” hat. It’s an interesting name that manages to be very descriptive and utilitarian yet whimsical and artistic at the same time! Knit Picks has handicapped it to “Wind and Sea” hat, which just doesn’t have the same ring to it. Their Cotlin yarn is perfect for this type of outdoorsy, summer weight knitting though. When I share the professional pictures on Ravelry, I always make sure to show my own images of the project as well, so that people don’t assume I’m just ganking the cover image. Those gleaming photos really are representations of my work! –it just happens to be my needlework, not my photography skills! My picture of this hat really dates the knitting project perfectly, since the very dim indoor lighting correctly represents that it was the darkest days on winter, and I can even spy some Christmas-related crafting among the mess in the background!